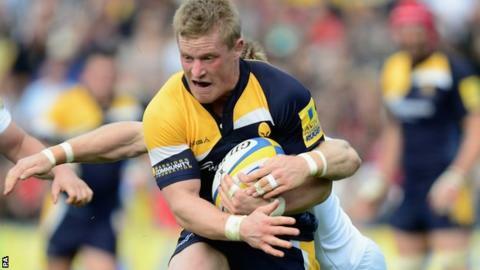 Worcester Warriors flanker Jake Abbott faces a long lay-off after rupturing his anterior cruciate knee ligament. The 25-year-old Worcester-born home-grown product suffered the injury in Friday's LV= Cup home defeat by Leicester - just three minutes after claiming his first try of the season. Abbott had appeared in every match under new boss Dean Ryan this season. "Jake's loss leaves a big hole. We'll miss his relentless energy," said the Warriors director of rugby. Jake Abbott has scored 14 tries for Worcester Warriors since making his debut in 2008. "However, I have no doubt that Jake will approach this challenge with the same determination and commitment that he always displays around the club." Abbott is to undergo surgery, but the struggling Premiership club are yet to offer a more exact indication of just how long he might be out. The injury is another blow to Ryan as, following two encouraging performances in the LV= Cup, Worcester prepare to return to league action at Sale on Friday. Adding in the five straight league defeats with which they ended last season, Worcester have lost 12 straight Premiership matches since their last league win on 1 March. That is the Premiership's worst losing run in almost 15 years, since Bedford also suffered 12 straight losses between October 1998 and January 1999. If they were to suffer a 13th straight league defeat at Sale, then there would only have been two worse losing runs in the near 20-year history of the Premiership.